This how-to describes a method for counting the members or admins of a wiki. In the community forum we have sometimes been asked how to count the members of a site or wiki.If you have the standard wiki page "system:members" in use then this how to shows you how to do it. 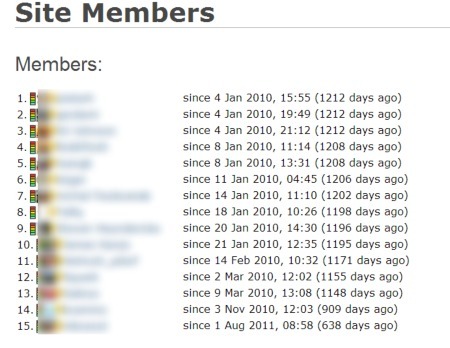 Lets assume you want to use your standard members list on the page "system:members". You need to add a CSS module to the page which uses CSS syntax to count the rows of the table. You can add the CSS module either at the top or the bottom of your page. If you have more than 100 members than the page layout is broken into sets of 100 members, every page starting again with 1. But this means only that the "page count" at the bottom equals the numbers of hundreds of all members! With such a technique our own members shows the result: on the first page there are 100 members and on the last (page 3) there are 59 members as at the creation date of this how-to. That means that at the moment (on 30.4.2013) there are 259 members of this wiki.